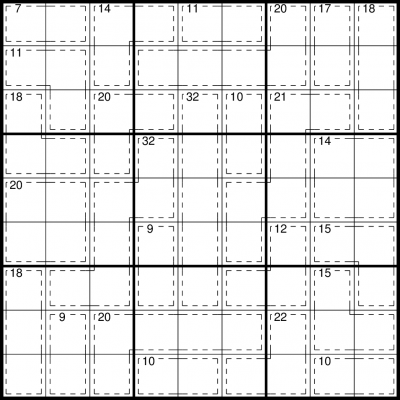 The rules of Killer Sudoku present a wicked twist on those of Sudoku, since you must not only place each of the numbers 1 to 9 into each of the rows, columns and bold-lined 3-by-3 boxes but you must also place the numbers in each dashed-line cage so that they add up to the given total. 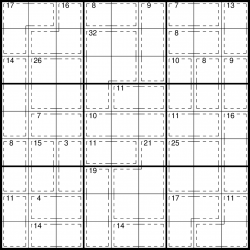 For example, the first two squares on the first row of the example puzzle on the right must add up to 7. You also cannot repeat a number within a cage, so this means for example that the solution to a cage with a total of'4' must always be 1 and 3, never 2 and 2 (although 2 and 2 would be disallowed by the standard rules of Sudoku in any case). There is only ever one possible solution, and it can always be reached via reasonable logical deduction. Guessing is never required. 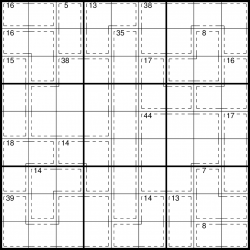 Solving Killer Sudoku can require a range of tactics - not only those from Sudoku and Kakuro, but also some methods unique to Killer Sudoku itself. 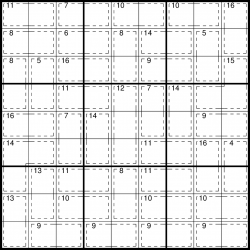 We can supply Killer Sudoku puzzles at various puzzle sizes and at a range of difficulties, as well as in variations such as with diagonal X-regions or jigsaw shapes instead of the underlying 3x3 boxes - see the samples below for more details. All of our puzzles are either entirely hand-made or have significant manual input into the process.